Recently, Mushroom has become my daughter's favorite. Thank God for that. Mushroom is one of healthiest vegetable available. It has all the possible goodness from anti-oxidants till anti-cancer properties. 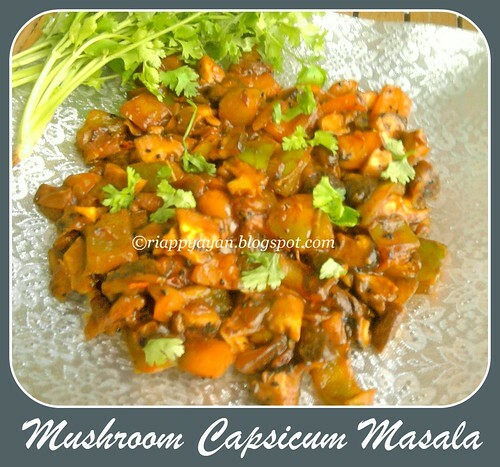 I have tried Paneer-Mushroom masala before and now I have tried Mushroom and capsicum combo. It's very easy-to-make and can be made within 30 minutes and perfect side dish with roti or rice or Pulao. Turmeric powder : 2 -3 tsp. Kasuri Methi(dry fenugreek leaves) : 1 tblsp. Heat oil in a pan, temper with bay leaf, cardamom, cinnamon and cloves, when they start to crackle, add chopped onion. Fry, stirring frequently, until onions get transparent. Add ginger-garlic paste, mushroom and capsicum and stir-fry together for 2-3 minutes. Add tomato puree or chopped tomatoes. cook in medium flame for 2 minutes or until fresh tomatoes get mushy. Add turmeric, red chilli and coriander powder and 1/3 cup hot water. Mix well and cook until oil seperates. Finally add garam masala powder and kasuri methi. Further cook for another 2 minutes. Add 1/2 cup hot water to make a thick gravy, season with salt and cook covered in medium flame. When gravy thickens, remove from heat and garnish with fresh coriander leaves. Nice combo......love the infusion of so many flavours!! I love mushrooms and I love capsicum! So this is going to be on my 'must cook' list! Nice combo,looks so delicious and yummy. Nice combo. Bookmarked. I'm your new follower. these are two of my fav vegetables. love this curry. 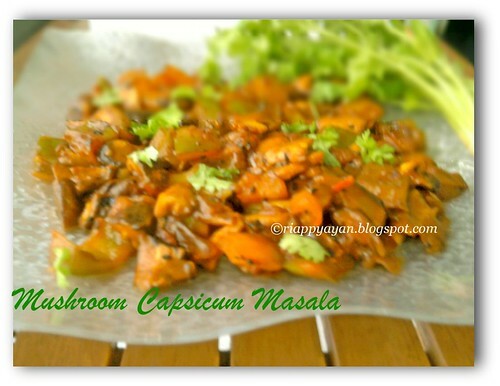 Lovely combination of mushrooms and capsicum. dish looks so delicious and perfect. this is just awesome Indrani..love it..
How are you? I like this recipe and the spicing...great , I will make a departure form the stir fried ones or the chines types. Your latest post on tomato rice is appearing on dash board but cant access. hey Indrani.. Lovely combo. 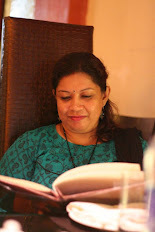 and grt clicks too :) Thanks for linking it dear.. Nice space you have. and Happy to follow you too ! Do visit my space at leisure..